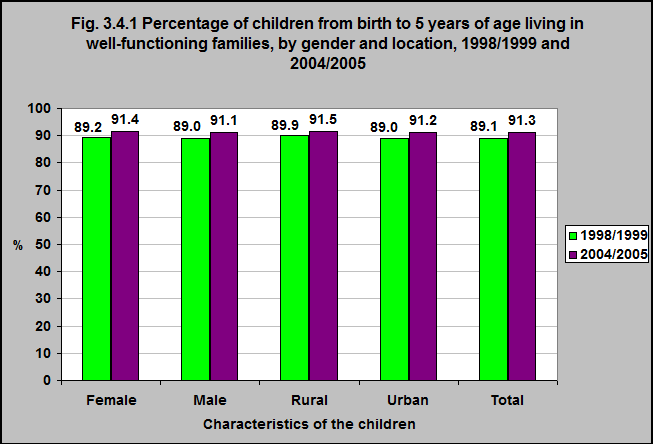 The majority of Canadian children under 6 live in well-functioning* families – 91% in 2004/05 and 89% in 1998/99. There is little difference in these rates regardless of the gender of the children or whether they live in urban or rural communities. The quality of family relationships is particularly important for the health and development of young children. Research has shown that there is a significant connection between family “dysfunction” and mental health problems among children. It is encouraging to note that the majority of young children live in families that function well. However, not all families are coping equally – and supports are needed to assist those in need.